BBC NEWS | UK | Magazine | Can different species 'talk'? A dolphin appeared to "talk" to two stranded whales before leading them to safety. How common is inter-species communication? Before the bottlenose dolphin turned up, the beached pygmy sperm whales were in clear distress. But when Moko arrived at Mahia beach on the east coast of New Zealand's North Island, their mood changed and they followed him to safety. And while many mammals have the ability to understand human language, they lack the capacity to articulate anything themselves, although apes have been known to use hand gestures. What's less well documented is the communication between species. Justin Gregg, vice president of the Dolphin Communication Project, said it is possible that a bottle nose dolphin and a pygmy sperm whale could communicate in some way. "But it wouldn't be instructions like 'hey buddy the open ocean is over here follow me'," he says. Dolphins use three forms of signalling to other dolphins - whistles, clicking and postures. Similar in size and colour to a bottlenose dolphin, it is possible that a pygmy sperm whale might have signals in common with a dolphin, just as different species of dolphins are known to share signals which might theoretically allow a form of basic inter-species communication. But just as it's possible that Moko the dolphin and the stranded whales shared a signal, it is also possible that the whales just saw a vaguely similar creature and followed it. And it is important to recognise that the dolphin was not giving detailed instructions in a form we recognise as language, says Mr Gregg. It is no longer thought dolphins have a language that can be decoded, they simply use a complicated communication system, like elephants or ants. There have been some other recent examples of inter-species communication. 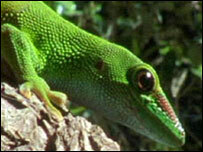 A few weeks ago, viewers of the BBC's In Cold Blood saw a gecko "beg" a sap-sucking insect for food. There are many reasons why different species communicate, say Vincent Janik, lecturer at the Sea Mammal Research Unit at St Andrew's University. "The animals exploit the systems of others for their own benefits. Sometimes the benefits are the same for each, therefore they share information. "Sometimes they are trying to take advantage of the other. Getting food may not be to the advantage of the one giving up the food." Ants protect the habitat of leaf lice and in return get a sugar excretion to eat, he says. They interact chemically and physically - the ants massage the leaf lice by secreting a small amount of the sugary food they are after. And honeyeater birds guide larger animals, like badgers, to a beehive for them to do the "dirty work" of breaking it so they can gain access. The communication takes the form of the honeyeater flying around the badger to get its attention then performing a call, flying towards the beehive and checking the badger is following. If it isn't, the honeyeater flies back to try again. Communication is often just one-way and completely inadvertent, says Mr Janik. "The vervet monkey listens to the alarm calls of the superb starling to find out what kind of predators are around. "Then the monkey follows an avoidance strategy accordingly, so if it's an aerial predator they duck under trees or if it's a leopard they run up trees. This way they improve their chances of survival." Inter-species communication most commonly takes the form of eavesdropping but it is not something that should be assessed in human terms, he says, because it's not done consciously. "It's a mechanism that's relatively automatic, it's not about forming a plan. The animal is trying to optimise its own survival chances and extracting the best possible information." I think this is a wonderful gap that research should fill. Animal communication also begs another question: the possibility of animal emotions and norms. Why did the dolphin "help" the whales? Is it possible that the dolphin was kind- it has somehow learnt a norm of assisting those in need, perhaps it felt empathy. However, the nature of science is problematic because in order for research to be done on this, science needs to move beyond the physical, towards the "spiritual". Science needs to get soul. I can't believe the ignorance of comments like Anne Boyce suggesting that scientists are 'afraid' of discovering that animals are intelligent. I'd venture (being a science student myself) that Scientists conclude that animals aren't as intelligent as humans *because that's what the evidence suggests*! To further undermine her claims that scientists are somehow 'fiddling' the results, there's actually plenty evidence out there that suggest some species are indeed very intelligent to the point of being self-aware. Some of the comments you have posted so far are rather of the "four legs good, two legs bad" variety. Human languages, comprising tens of thousands of distinct words assembled according to complex usage and rules of syntax, expressing thoughts with infinite nuance, are not even remotely approached by any other species on the planet. And we can broadcast our communications to all other members of the species (as we are doing right now). Dolphins definitely can't do this. This doesn't make us superior, at least not ethically, nor deny animal communication nor intelligence, nor that we too follow instinct as much as thought. Just about every other species on the planet communicates better than the human race. We have for so long assumed we're the masters of the planet, rather than the guardians of it, that we are unable to hear or see anything else. Why do scientists have such a problem with the thought of animals communicating? It seems to me that they are so afraid that animals might be considered intelligent, any studies into animal communication and/or intelligence always end up with the scientists concluding that the animals are only acting on instinct. Are they afraid? Or are they just hell bent on preserving the myth of human superiority at all costs? I personally don't find the idea either frightening or ridiculous - maybe we should start to change the way we interact with the animal world and consider any possible consequences? Much more research needs to be done into animal communication. If our cats and dogs can learn to understand human words they most certainly do have an idea of communicating. Pets do communicate with owners, we have to be observant to learn and understand what they are telling us. Given the way we use and misuse animals I don't think it is in the scientific world interest to find out just how well animals can communicate, it might make humans feel pretty bad. It may seem to all make sense, from the perspective of a species that has never mastered the language of another species. The question of humans not being superior in every way is usually finished with the religious argument of souls, this however is about speech. I do believe that many species can communicate with each other and just because we don't understand it doesn't make it simplistic automatic reaction. I think that we need to remember that our languages aren't even universal among our own species, when we have got past that than maybe we will start to understand other species.